Also known as Caribbean Stud Poker. It is a simple five card casino poker game in which the player places a bet in the ante circle which entitles them to receive five cards face down. Our croupier also receives five cards however one of them is face up. 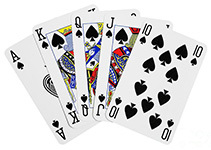 The player looks at their cards and decides whether to play or fold. If the player ‘plays’, then they must bet exactly double the amount of the ante. If the player wishes to fold, they will lose their ante. Once all the players have decided, our croupier reveals their remaining four cards. 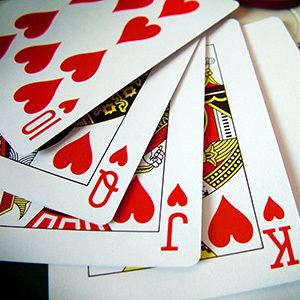 The important rule is that the croupier only ‘plays’ with an Ace and King or higher. If the croupier is in a position to play, they will compare their cards to the player’s cards. 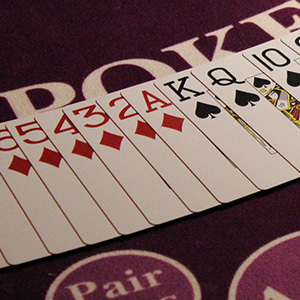 If the player’s cards beat the croupier’s cards, the player will receive even money on their initial bet and a multiple amount on the second bet dependent on what sort of poker hand they have. A pair being a lower payout than say a 4 of a kind. Not sure how to play Casino Stud Poker? Our croupiers are only to happy to explain the rules and teach you how to play (and hopefully win!). Please click here for a copy of the rules of Casino Stud Poker. Casino quality Tables, all of our tables are purchased brand new from the leading casino manufacturer. We only use Professional Croupiers. 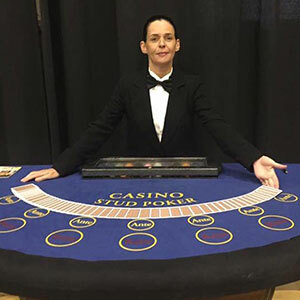 90% of our croupiers work exclusively for us. They are polite, friendly and know how to have fun. They will arrive in smart evening attire and will be happy to teach your clients how to play the games. There will be a bottle of celebration Champagne and a casino t-shirt for the highest earner. Free customisation of Fun Money – send us an image of your choice, along with any event text and we will customise your fun money vouchers unique to your event. To hire an Glasgow Fun Casino package or to discuss how you could save money with our multiple booking discount please call us on 0845 304 2495.